The culmination of tough legislation, and six months of negotiations resulted in the approval of $135 million for agricultural equipment in California. This momentous event occurred at the California Air Resources Board (CARB) hearing in Riverside this past week. This funding will replace ag tractors and harvesters, ag trucks and ag irrigation pump engines. 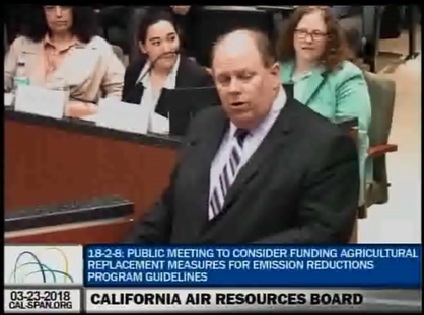 This is critical because the California Air Resources Board is forced to consider mandatory tractor replacement regulations in the San Joaquin Valley, due to the imposition of incredibly restrictive federal ambient air quality standards. Without federal action to delay those standards, CARB is obligated to consider all potential measures, including a mandatory tractor replacement rule, such as those already being implemented on trucks and construction equipment. The Association pushed for this funding, as it is the only way agriculture can comply without being forced out of business. At the hearing, Association President/CEO Roger Isom stated “the problem with agriculture is that we have no way to pass along the cost.” The funding plan was approved unanimously and money should start flowing to the air districts in the late spring. This entry was posted in NEWS & ISSUES on March 26, 2018 by ccgga.